On Friday, December 15, Andre J.L. Koo (MBA ‘94), Chairman, Chailease Group, was honored by NYU President Andy Hamilton and Dean Peter Henry in recognition of the landmark gift made by Andre and his wife Jana to support the School’s new one-year Tech MBA program. The program is now officially named the Andre Koo Technology and Entrepreneurship MBA and will enroll its first class in May 2018. President Hamilton welcomed guests, who included members of NYU Trustees, Batia Wiesenfeld, who holds the Andre J.L. Koo Professor of Management faculty chair, senior leadership and faculty who will oversee the program, and students. Recognizing Andre Koo’s landmark gift, President Hamilton called it a groundbreaking investment in the future of technology, innovation and entrepreneurship at NYU Stern. Dean Peter Henry expressed how incredibly proud and grateful he is for the Andre Koo family legacy of support for the School. He also shared that over the last eight years Andre has become a great friend and an advisor, and that his gift will keep the School on an upward trajectory of being the higher ed epicenter of the burgeoning tech ecosystem in New York City. As Stern is fostering the critical intersection between business, technology and entrepreneurship, Andre Koo said he was pleased that the School’s new MBA program will meet the growing demand for people who can lead the integration of technology with business goals. “I have no doubt that this program will prepare students to take on the challenges and seize the opportunities that technological innovation presents us with. And while the possibilities related to technology-driven innovation seem endless, I know from experience that a solid business foundation is critical to succeed,” said Andre Koo. 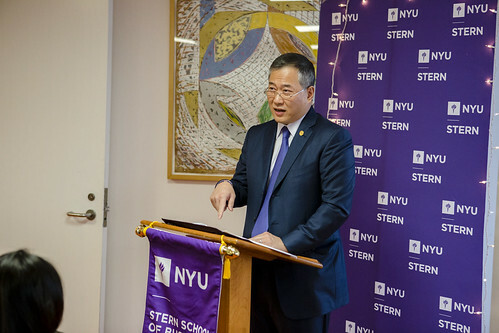 Andre Koo’s family has strong ties to both Stern and NYU. Andre’s father, Dr. Jeffrey Koo, was a Stern graduate and was an NYU Trustee, and his son, Andre Jr., who was at the celebration, will graduate in May from the Stern Undergraduate College. Andre Koo is deeply engaged with NYU and Stern and gives generously of his time towards fostering community. He co-chaired the Global Alumni Conference in Shanghai in 2013 and serves on the Stern Board of Overseers, is an NYU Trustee, the president of the NYU Pan-Asian alumni association, and is now the latest member of the Tech MBA Advisory Board.